Bruxenomics: Who is going to win the race for AI: China or US? 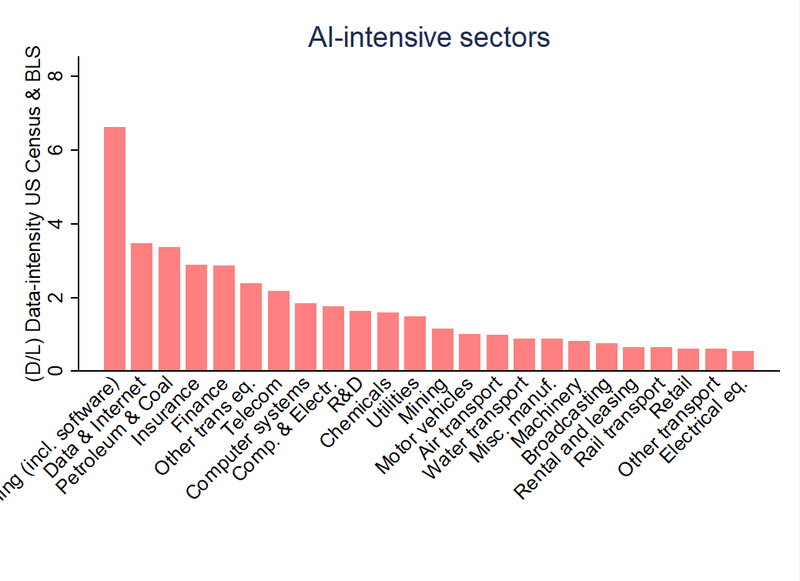 Incidentally, these are exactly some of the services and industry sectors that a recent BCG study has outlined as promising sectors regarding the effect of AI adoption on offerings and processes between now and five years. 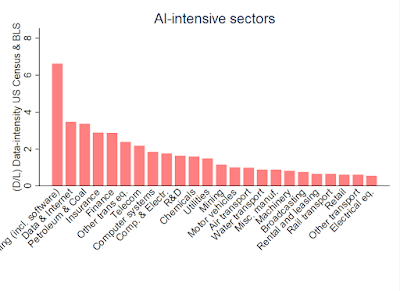 In their study, large gains from AI are expected to come from logistics, transport, IT services, telecom, utilities, chemicals and financial services, as well as the automotive sector. These sectors are traditionally complex and skill-intensive sectors, and also employ a large amount of capital which are factors that traditionally advanced countries such as the US have an abundance of. Does that mean that the US is therefore in a better position to develop comparative advantage in AI? Not necessarily. One factor that seems of particular importance whether a country will develop itself into an AI powerhouse is development of the most advanced algorithms, which will likely be used in all these AI-intensive sectors. Algorithms are developed by software engineers who have enjoyed strong educational programs based on mathematics and science. This will probably be one of the most important factor that is going to determine whether a country can absorb its software skills into sectors susceptible to AI – and therefore develop comparative advantage. Countries with a strong base in mathematics and science education are likely to create long-lasting productivity benefits of producing and exporting sectors that use a high amount of AI. A quick look at the WEF ranking on the strength of countries’ quality of math and science education reveals and equally interesting pattern. Countries such as Singapore, Finland and Switzerland have a strongest base regarding math education. Other European countries are Netherlands, Belgium and Estonia. The US is number 10 in line, whereas China comes at number 50 in the entire ranking of almost 200 countries. Unexpected countries with good quality of math are Lebanon and Qatar. Whoever wins the battle of AI, the country which develops a strong university system for software developers with qualitatively good digital skills in math and sciences will probably benefit most from AI. Moreover, Oren Etzioni, CEO of the Allen Institute for Artificial Intelligence notes that “all core AI breakthroughs have their origins in academia”. For now, it seems that the US is in a good position, but China is catching up fast. That means that in a few years’ time, China could potentially equally share huge economic benefits from specializing in AI-intensive sectors and develop comparative advantage. On the other hand, the US has a long tradition in developing and generating strong expertise in precisely some of the AI-intensive sectors. Combining that with some of the strongest universities that attracts the world’s best talent, it’s also in a good position. Yet, policies matter too, and that might be a second determining factor who gains from comparative advantage in AI – and perhaps even the single most important factor. China has often been claimed of having less strict privacy rules on data which would allow the country to exploit and experiment in AI. Yet although that may be true, ECIPE’s new Digital Trade Restrictiveness Index (DTRI) also shows China is vastly more restrictive on many other data policies, also when it comes to the cross-border flow and domestic usage of data. That said, the US also wants to restrict policies regarding attracting foreign talent, which will also have an impact on digital talent flowing into universities or Silicon Valley and will further impede profiting from prospective AI benefits. Taken together, winning the AI race cannot be answered in a clear-cut manner. Point is that both can benefit from AI by introducing the right enabling and policy framework.